(CNN) -- Huddled on the top floor of her home after waist-deep water inundated the lower story, Doranne Lim is bothered by the debris -- and the smell. 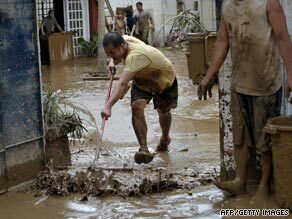 Residents remove mud from a home Monday as waters recede in Marikina City, suburban Manila. "My house is super, super messy," she said, speaking from her home in the eastern Manila suburb of Pasig City. The mud left behind by receding floodwaters -- caused when the nearby river flooded its banks -- is "really smelly." Her car won't start, probably because the engine is flooded. Her microwave and refrigerator won't function. Most of her possessions have been moved upstairs. "My office mate, she lives in a village with actually really nice houses," Lim said. "She was sitting on her roof for 15 hours. They didn't save anything, nothing." Lim said she is cleaning up the smelly mess, but no one she knows has begun fixing the damage -- because another typhoon could be bearing down on the island nation in several days. Tracking maps show Tropical Storm Nineteen approaching the Philippines later this week. Lim submitted a photo to CNN's iReport site of people traveling down a flooded road -- a main thoroughfare -- in Pasig City. Some are wading through thigh-deep water; others are being pulled on rafts. Some opportunists are charging others money to pull them on rafts, she said. At the end of the road is a church and a market, she said. The market is not flooded, but is "really, really muddy," she said. "Most of the vendors in the market said they are going to sleep in the market tonight because they don't have any place to go." Power and water supply failed in some areas. Roads were rendered impassable, making rescue efforts challenging. Rescue crews were handing out food rations. "Right now the challenge is to find out how many people have actually died and how many people we have to take care of in terms of people who've been displaced," said Richard Gordon, the chairman of the Philippines National Red Cross. He estimated up to 300,000 people have been displaced on the island of Luzon alone. Another Pasig City resident, Arturo Fidelino, said 80 percent of his village was flooded. He counts himself lucky that his home was not inundated, but his family had to evacuate and move in with his in-laws because nearby streets were impassable. Fidelino said he and his wife have to get to work, and their 14-year-old daughter has to get to school. Fidelino said his family was stuck in their home for two days, before a relative who owns heavy machinery was able to remove them. "It's our first time to experience that kind of flood," he said, estimating it could take about a month for the waters to completely recede. He said many of his neighbors remain stuck in their homes, as the homeowners' association organizes a removal effort. Other Pasig City residents were evacuated to temporary shelters set up in a municipal hall or gymnasium, he said. Fidelino said many Filipinos aren't sure if the flooding was caused by the typhoon or by the opening of dams. "It was so sudden," he said. "It was sort of a flash flood." The floodwaters contained all sorts of animals as well -- snails, snakes, Lim said. Two crocodiles escaped from the zoo, she said -- "it's funny, but it's scary." "I'm happy that I'm a lot better off than so many other people I see on TV, clinging to electric posts, electric wires, so they won't be carried away (by the water)," she said. "I have friends who are still missing their siblings, missing their dogs." Both she and Fidelino said residents have banded together to help one another. Lim said that after her electricity was restored, she got on Facebook, where she saw numerous posts from people seeking missing friends or loved ones. Members of the media and even the government were trying to help on the social networking site, asking them to send more information. Some people are putting together "relief bags" of food and other items to distribute to those in shelters, while others were bringing canned goods, Lim said. "Everyone is united right now to help feed everyone," she said. Others are just trying to feed themselves. John Gonzalez, 11, has been pushing a trolley through his flooded neighborhood in Manila's Marietta Romeo village for two days. "The flood went above the height of a man," he said. "Way above our heads. Today, the water just comes to my mouth. That's why we are out looking for food." CNN's Dan Rivers contributed to this report from Manila, Philippines.